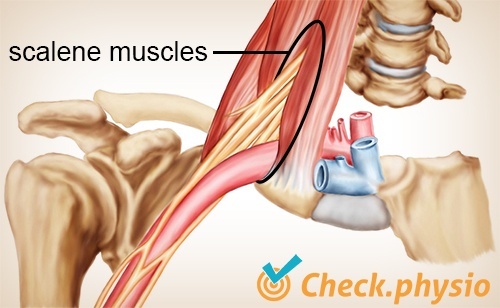 Thoracic outlet syndrome (TOS) is a collective term for conditions in which a neurovascular bundle in the shoulder region becomes compressed. This results in problems in the area supplied by the neurovascular bundle. The symptoms occur primarily in the arm and hand. The common neurovascular bundle runs from the neck and chest cavity to the arm. 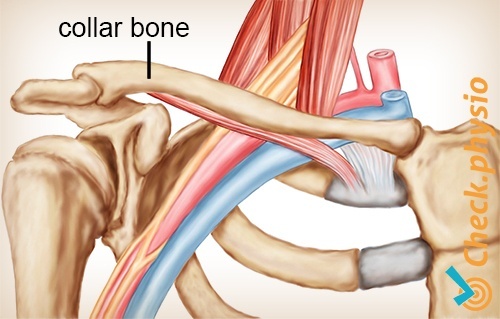 The bundle crosses the first rib and runs under the collar bone to the arm. 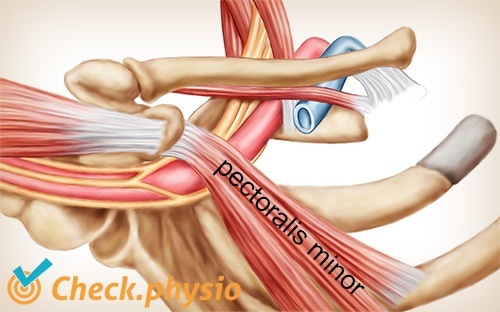 It can become compressed at various sites in the shoulder region. As a result, signals are not passed on properly and the flow of blood is disrupted. A separate name is used for each site where the neurovascular bundle can become compressed. 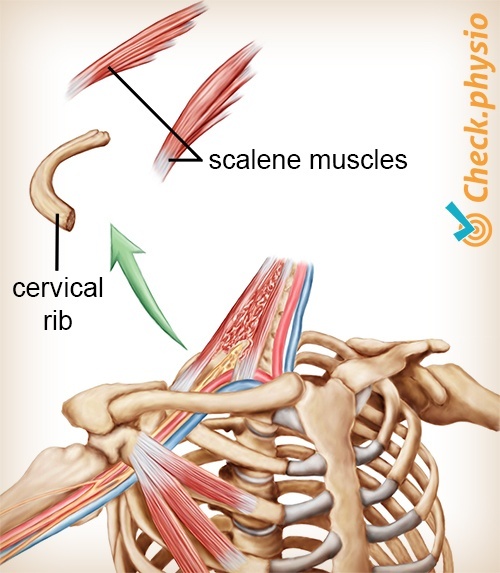 For example, we have scalene syndrome (compression between the scalene muscles), cervical rib syndrome (compression caused by extra ribs in the neck), costoclavicular syndrome (compression between the first rib and the collar bone) and hyperabduction syndrome (compression beneath the pectoralis minor muscle when raising the arm). The cause can be attributed to various factors. This depends on a person's physique and posture. People who work in the same position for extended periods are at increased risk. Feeling of fatigue in the hand or arm. A swollen arm and hand. This can cause a tense feeling in that part of the body. Pale or blue discolouration of the arm and hand. Pain with activities that involve working above shoulder height. Weaker pulse in the wrist. Pins and needles, irritation, numbness or loss of strength in the arm, hand or fingers. 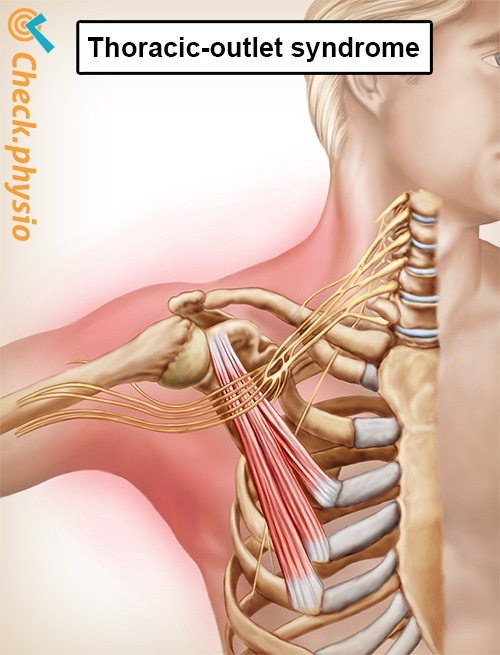 There is currently no general standard for making the diagnosis of "thoracic outlet syndrome". The patient's signs and symptoms, together with the results of various physiotherapeutic tests can raise the suspicion of this condition. The diagnosis is also often made incorrectly in the case of unexplained (neurological) symptoms in the arm. Sometimes an X-ray can reveal the physical abnormality (that results in compression of the neuromuscular bundle). The treatment is aimed at reducing the impingement of the neurovascular strand. Usually this involves physiotherapeutic treatment in which the patient is advised to perform daily exercises and to maintain physical fitness. In addition, posture instructions and taping techniques can be used. In some cases, surgical release of the compression can be considered. Schünke, M., Schulte, E. & Schumacher, U. (2005). Prometheus. Algemene anatomie en bewegingsapparaat. Houten: Bohn Stafleu Van Loghum.